I fell in love with Con Dao when I visited it the first time and the love grew ardent when I came back to the island, which is 97 nautical miles off mainland Ba Ria-Vung Tau Province. Breezes, the pleasing sound of waves lapping gently against the shore and serenity greeted me when it set foot on the island on my second trip. After a tour around the center of Con Dao Town, my friend and I rented a motorbike to ride on a 14-kilometer road that winds its way through the waters on one side and forests on the other side to Dam Trau, a pristine beach near Con Dao National Park. 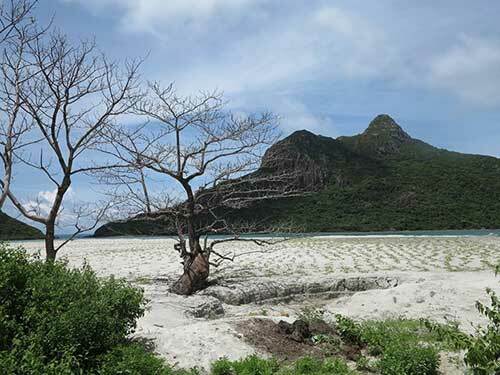 Surrounded by old trees and boulders of various shapes, Dam Trau is touted as the most beautiful beach on Con Dao. We lied under the shade of trees on the untouched beach to enjoy the breezes from the sea, the sweet sound of waves lapping against the shore and the blue sky. From Dam Trau, we could see Cau Islet far away. A legend has it that a man named Cau and a woman named Trau fell in love with each other without knowing that they were siblings that share the same father. When learning the truth, Cau left for an islet and led a secluded life until he died, leaving Trau in great misery. Trau committed suicide by jumping into the sea after she had found out the true story. Later, an areca tree, which means cau in Vietnamese, grew at the place where Cau passed away. This is why local people call the islet Cau and the beach area where Trau died Dam Trau. An Hai Lake is another destination that visitors to Con Dao should not miss. 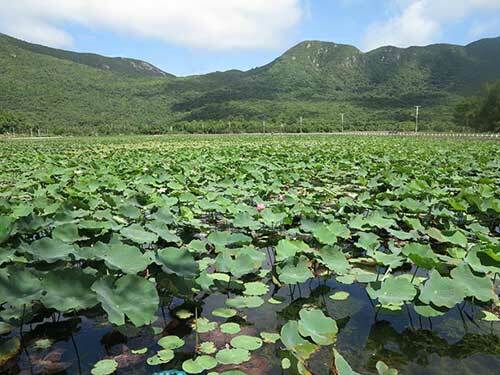 I was impressed by lotus and water lily flowers in the 31,000-hectare lake located between ranges of mountains and hills. We came to Dam Port. For me, the road from An Hai Lake to the port is one of the most scenic seaside roads that I have ever seen as the road runs through imposing mountains on one side and the turquoise sea on the other size. On the way to the port, we stopped by Nhat, which is a stunning beach with smooth sand and beautified by layers of gravels and rocks. A local told us how lucky we were as the beach only appears for several hours of the daytime, usually from 11 a.m. and 2 p.m.
Our friend on the island said the beauty of Con Dao is so mysterious and special that visitors should to take time to discover and perceive it at different hours of a day and in different weather conditions. Con Dao is renowned for not only its serenity but also historical sites.